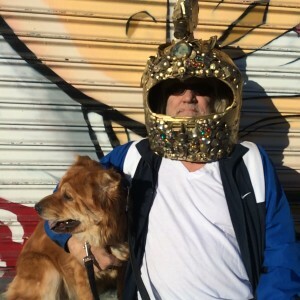 Los Angeles has long had a reputation as a center for oddballs. The longstanding east coast joke about tipping the country and all the weirdos falling to the “Left Coast” is thankfully not entirely untrue. The weirdos are our blessings; our sparks of originality and creativity… the artists, the innovators. Being labeled as a weirdo is a high complement. Arriving from the east coast in 1989, I was struck with the differences of this sunny new city of mine. The characters here were so bright, conspicuous and well, shiny. I was baptized with the pink splendor of Angelyne and the odd Venice Beach guitar playing, roller skater Harry Perry. 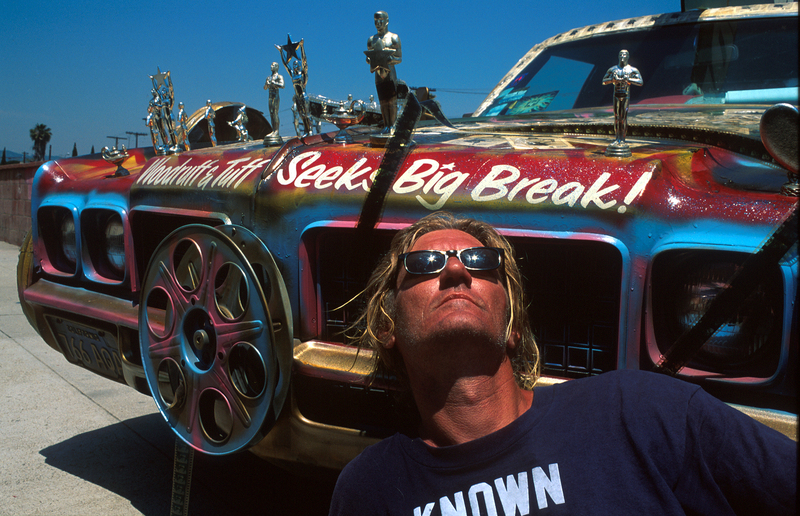 The super cool art cars of actor Dennis Woodruff were amazing to me, publicizing his acting talent in the grandest and most creative way, by driving around the city in what essentially were moving billboards. Dennis was raised in Huntington Beach, the grandson of S.H. 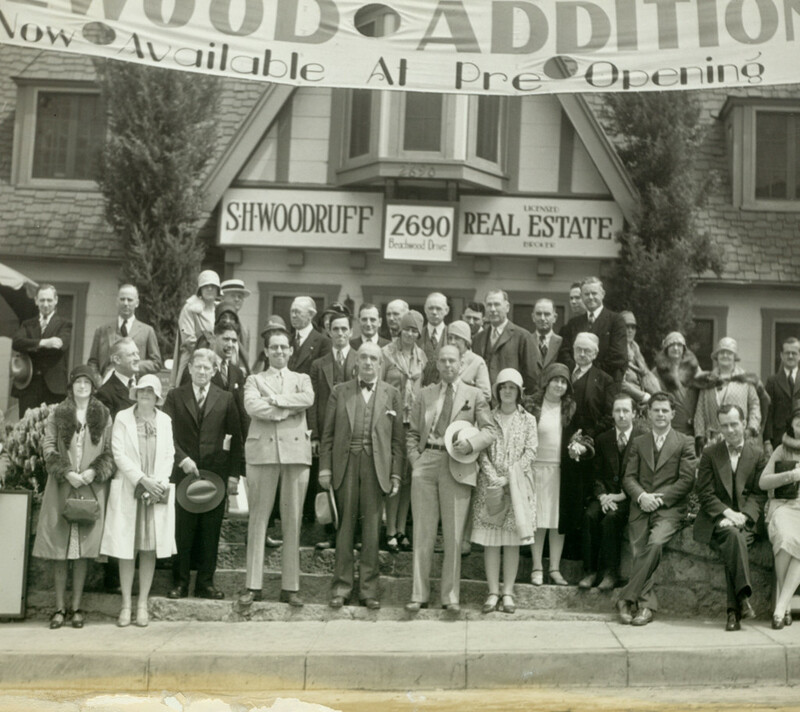 Woodruff, one of the original developers of Hollywoodland, the housing community nestled in Beachwood Canyon, the beginning of the Hollywood we know and love today. Its now famous, larger-than-life sign dropped the land and was shortened to Hollywood as the neighborhood grew. Dennis’ grandpa became head of the Hollywoodland real estate development in 1923, when the real estate agent, who he had been assisting, passed away. S.H. Woodruff was also critical in the early development of Dana Point, beginning in 1927, and had been involved in the reconstruction of San Francisco after the 1906 earthquake. Several years later, the Great Depression turned Woodruff’s real estate holdings cold and in 1935 he gave his Hollywoodland holdings back to the original owner, M.H. Sherman Company. Dennis was 7 years old when his grandfather passed away, following the death of Dennis’ father, who had worked as a film camera man. The family fortune had all but evaporated and Dennis was raised by his mother. 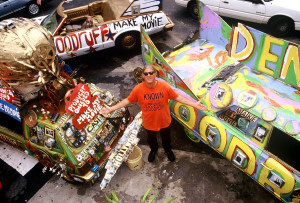 Dennis first got the acting bug as an art and theater student at Orange Coast College and moved, shortly afterward, to Hollywood where, a decade later, his art cars took root. 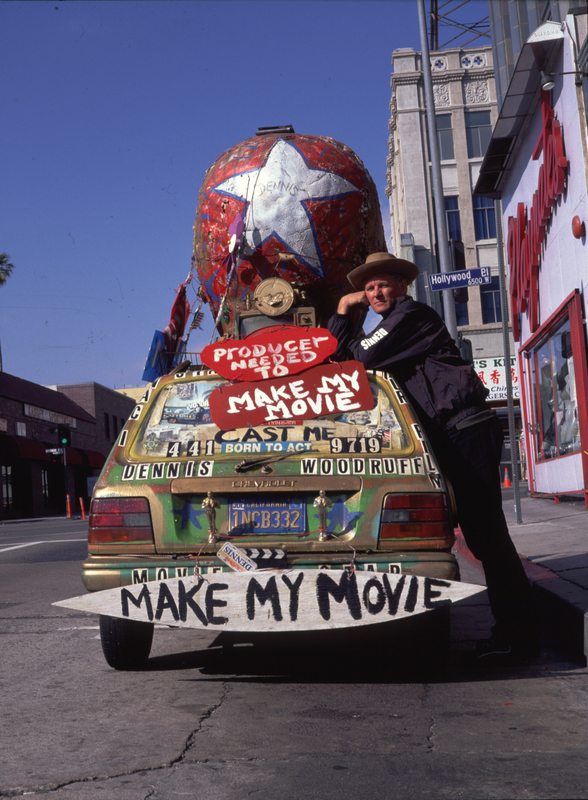 From the mid-1980s to the late 1990s, his cars became an important part of L.A. lore. Like sightings of Angelyne, they were an ubiquitous and undeniable part of the Los Angeles experience. 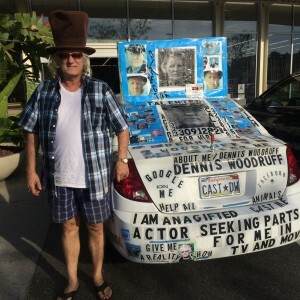 After a time, Dennis became frustrated with having his cars taking the leading Hollywood role that he’d always wanted. By the early 2000s he began focusing on making his own D.I.Y. films in which he took the part of director, producer and actor with help from partner Keith Kurlander. These low budget films are campy to the extreme, with titles such as Obsession Letters to David Lynch in which Woodruff plays an obsessed fan, the self-explanatory Horrors from the Laundromat or his ultra-strange lo-fi/sci-fi film, Spaceman. 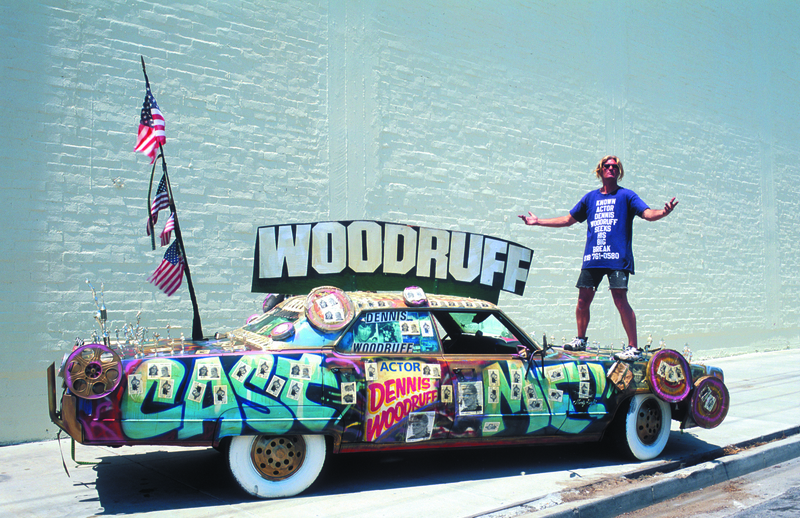 Woodruff’s film are all available for download at his website The Dennis Woodruff Show or can conveniently be purchased from Woodruff himself, from the trunk of his current art car. 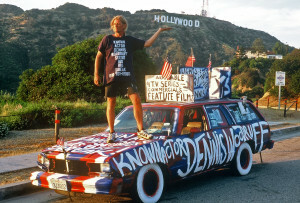 This entry was posted in Art, Miscellanious, Offbeat LA and tagged Cars, Dennis Woodruff, Nikki Kreuzer, Offbeat LA. Bookmark the permalink. Pingback: ‘The Disaster Artist’ Is The Highlight Of James Franco’s Career – AccessPressMag.com, welcome you!